Without a doubt North Goa is a paradise for Sundowners. 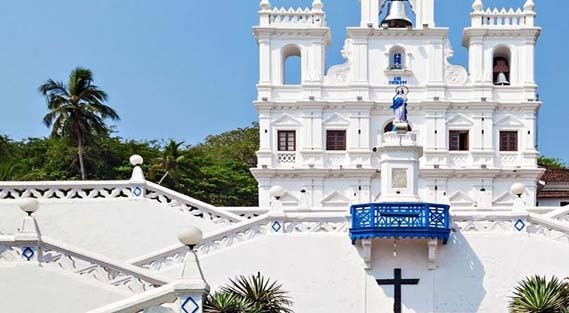 Home to some really pretty beaches and peace giving places of worship, North Goa is an essential part of the Goa holiday experience. There is so much that one can indulge into while at this part of the beautiful state that one may never wish to go home. Nature lovers can choose from variety of places to call their nest, whereas the adventure seekers can freely sway from here to there as vivid water sports await them. Romantic couples can find their moments in the backwaters and isolated places, whereas Amigos can hangout together in coolest shacks and groove to some awesome music. Gastronomists can relish the delectable food and the solitude seekers can choose a lonely cliff with a view for themselves. The region offers something for everyone and most of all a queer peace of mind that is rare to find anywhere else. Aguada Beach in North Goa is a popular tourist attraction. Catching the eyes of the beach lovers, the beach’s highlight is the fort that stands on a cliff that faces the Aguada beach. Pristine and calm, Aguada beach is perfect to enjoy evening strolls and witness the sun setting down. One can enjoy variety of watersports here along with hanging out in cafés, getting a massage and shopping for a range of items. Aguada resort that is perched over the cliff is a popular hotel complex and has kept a partial portion of the beach for its guests. An ideal way to enjoy and explore the beach and the rich history of the fort here would be to check yourself in the Aguada resort. Sheltered by a rocky foreland and tucked at 10 km of distance from Mapusa, Baga Beach in Goa is a lovely retreat house and paradise for nature buffs. It's a long sandy beach packed with lively shacks, resorts and fishing boats. Being quieter and isolated, it stands among high hills and deep blue Arabian Sea. Wandering all around and relishing several souvenir shops to the best party's center of the city, the captivating beach offers a wonderful retreat with a wind of vibrating energy. Whether it's the endless drink & food or the water sports, this beach is full of life and one can enjoy every bit of second, being in the lap of nature. Baga usually figures high on tourist routes due to its exciting nightlife, flea market, eateries and watering holes. Popular for its shack life, many food and drink joints are provided by St. Anthony's for delicious seafood and the well-known Cafe Mambo and Tito's Bar for the night-time revel. The beach provides a plethora of options for the one who is looking for some escapade. Spend some memorable time in the lap of nature, leaving back all your stress and worries. Situated amongst the tranquil surroundings, the beach offers mesmerizing view of glistening white sands, sky blue water and swinging palm trees. It's one of the favorite hangouts for nature enthusiasts, where one can relish the scenic beauty of a place. For couples, a candlelit dinner at the beachside is a perfect retreat for making it a romantic Baga beach holidays. Calangute Beach is the largest beach in north Goa. Located between Candolim and Baga beach, it is a hub for tourists and backpackers from all over the world. The beautiful golden stretch of sand and scintillating water coupled with the gentle rhythms of pop music that plays here makes it the perfect destination for a laidback afternoon. This shore of the sea is a glittering beauty and is also known as the 'Queen of Beaches' owing to its picturesque sceneries. Being one of the busiest and the most commercialised beaches of Goa, it is swarming with eating joints, shacks and clubs serving mixed drinks, beer and seafood. This flagship beach of Goa is also known for its water sports activities like parasailing, water surfing, banana ride and jet-skiing. While the days here are filled with breathtaking scenic beauty, nights call for frantic parties and letting your hair down. With some of the most amazing nightclubs and pubs within its bounds, Calangute Beach attracts tourist from all around the globe owing to its festive and entrancing environ and is every party animal's dream come true! The Goa State Museum, located few kilometres away from Aguada, was constructed in the year 1977. Possessing a huge collection categorised in terms of history, religion and art, the museum attracts many visitors throughout the day. The premise is segmented into 12 galleries and houses a collection of more than 8000 articles. The belongings of the museum consist of Hindu and Jain sculptures, handicrafts, timber items, coins, textiles, manuscripts, paintings, mud models from all across India and anthropological things. Different artefacts, copper inscriptions and pebble sculptures, attract visitors to the gallery. The famous Contemporary Art Gallery showcases paintings and sculptures of eminent Indian and Goan artists. Possessing some uncommon portraits, The Unique Freedom Struggle Gallery gives an idea of the freedom struggle of Goa. Chapora Fort, which is situated on Anjuna-Beach in Goa, is one of the famous sightseeing attractions among travellers. The Chapora Fort was built by Adil Shah, the ruler of Bijapur and therefore, the fort has been named as the town of Shah that is Shahpura. The fort was built in order to keep a watch on Hindu raiders who wanted to set up their territory in Goa. Around 1617, the Portuguese rebuilt the fort and made underground tunnels in order to escape at the time of any emergency. After the rule of the Portuguese, Chapora Fort was never occupied again by any ruler and was abandoned. Built in red laterite stones, the fort has steep slopes on all the sides and stands on an area which has irregular outer plan. The fort is one of the popular attractions as it gives a view of the Anjuna-Beach and the Vagator Beach. Tourists can reach this site by hiring taxis and buses. With energy to it that is contagious, and an aura full of romance; the Dona Paula is one of the most happening beaches in Goa. Located only seven kilometres away from Panaji, and nestled in the southern part of the headland where the Mandovi and the Zuari rivers meet the Arabian Sea, the Dona Paula beach also provides a magnificent view of the Mormugao harbour. The place is always bustling with energy and is the ideal spot to relax and sunbathe, thus making its way to the top of the itinerary of every tourist who visits Goa. The Dona Paula Beach is also very popular as a lovers paradise because of the myths attached to this place. Even though different versions of the legend exist, they all boil down to the passionate and unfulfilled love affair of Dona Paula. Fringed with casuarinas woods and palm trees, the place attracts tourists from all over the world for its pristine and natural beauty as well as scenic views. A walk down the coastline with its long stretch of silvery white sand, while the cool breeze blows gently on your face and the birds fly back to their nests as the sun sets down, is indeed an experience to remember. Local knick-knacks can be purchased at the beachside stalls while scrumptious seafood can be enjoyed at the local restaurants. All in all, visit this beach if you want to experience adventurous water sports, dazzling nightlife and romance, all rolled into one. Reckoned to be one of the largest temples in Goa, Mangueshi shrine is situated in Mangueshi Village in Priol. The main deity in the temple is that of God Mangesh, who is believed to be the incarnation of Lord Shiva. Mangueshi Temple is 450-year-old that stands out with for its simple and yet exquisitely elegant structure. The temple consists of several domes and balustrades. There even seats a prominent Nandi Bull and a beautiful seven-story deepstambha (lamp tower), stands inside the temple complex. The temple also has a magnificent water tank, which is believed to be the oldest part of the temple. There is a spacious assembly hall which can accommodate 500 people at a time. Chandeliers of the nineteenth century adorn the temple. The annual festivals including Rama Navami, Akshaya Tritiya, Anant Vritotsava, Navaratri, Dussera, Diwali, Magha Poornima Festival (Jatrotsav) and Mahashivratri. Magha Poornima Festival begins on Magha Shukla Saptami and ends on Magha Poornima are celebrated in the temple with much pomp and show. Built in 1541, this is reckoned to be the first church in Goa. Seeing a complete renovation in 1619, The Church of Our Lady of Immaculate Conception is a riot of heavy ornamentation. Believed to be a fine example of relatively simple architecture, the church still boasts of two flanking altars that on the left dedicated to Jesus Crucified and the right one dedicated to Our Lady of Rosary. A great deal of carvings can be seen on each side of the marble statues of St. Peter and St. Paul. The main altar is that St. Francis Xavier; his glass encased statue is positioned centrally on the reredos. A large number of visitors come to visit this place of worship in Goa and indeed you should visit this religious place to witness some excellent architecture. Situated in Panjim, Kala Academy is a fine acting institute in Goa. It is in a way a cultural heritage of the state that has produced a large number of artists that excel in the field of art and culture. The Academy is an apex body to develop Music, Dance, Drama, Fine Art, Folk Art, Literature etc. and to promote cultural unity of Goa. It has a distinctive character of imparting training, also on regular basis festivals, competitions, exhibitions, workshops, seminars, discussions and debates, performances and other activities for preservation of traditional art forms are organized here. One can visit the State Art Exhibition and also can see performances that happen every now and then here. Situated in Sanquelim, Arvalem Waterfalls is one of the most beautiful pieces of nature that one can enjoy in Goa. The fall is located at a short distance from Bicholim. Arvalem also known as Harvalem comes to life in the monsoon season. It drops down from the height of 50m and offers quite a view to relish. Visitors can also explore the nearby Arvalem caves as well as Rudreshwar temple. The best way to reach here is by taking a taxi or on foot. One of the ideal ways to enjoy holidays in Goa is sail in the houseboat on the backwaters of Chapora River. By taking the houseboat, one can enjoy the rustic charms of Goa. Watch the traditional fishermen catch fish in their dug out wooden canoes and see the beautiful swaying coconut and palm trees fringing the water body, offering an ideal site that any nature lover would adore. The backwaters of Goa are truly scenic and thus are a must visit. One can choose to hire a boat for a day and enjoy the sail, also there are options to stay in the houseboats and relish some quality time with a loved one. Anjuna Beach Flea Market is a small carnival in itself. Held every Wednesday, this market is visited by expats to Indian tourists to locals alike! A happening flea market, where one can find lot of activities till late night. The market evolved in the 1960s, when hippies headed to Anjuna for trance music and parties. Initially, the market was more like a garage sale, where hippies would sell stuff in a bid to earn some extra money. However, the current market is no less than a fashion street, where one can find great souvenirs, fashionable clothes and lovely artifacts. Food stalls are also the part of the market as well, where one can enjoy some authentic Goan food. Apart from its above mentioned waterfalls (Aravalem), Bicholim is altogether a tourist destination for sure. Undoubtedly scenic, it boasts of a beautiful lake called Mayem and the vast countryside that is dotted with cashew trees. It also has some historic Hindu temples like Saptakoteshwar temple and one of the oldest mosques in Goa. Mayem Lake is located in east of the market town of Mapusa, it is amidst the unspoilt countryside full of sleepy villages. The lake sits on wooded shores in low hills and is rich in birdlife. The distinct places here are the open cast iron ore mines that add to the already distinguished features of Goa. There best way to visit Bicholim is by taking a ferry route from Ribander to Chorao with Madel being the place for landing. Probably one of the most happening shacks in Goa, Curlies is a great place to visit if you are itself in North Goa. Located on Anjuna beach strip, Curlies has become one of the prominent landmarks in Goa. What started as a beach shack, Curlies is now a two floor complex with restaurants, bars, internet café, sea view veranda, tea house, indoor club that can host up to 500 people. Various water-sport and other activities like the parasailing, kayaking banana boat ride, dolphin trip, fishing trip, Grand Island trips are also conducted from the Curlies Shack. And ofcourse the mouth watering seafood, cheap beer and excellent music are the reason why you must visit Curlies in Goa. Vagator Beach is known for the red-cliffs and two fresh water springs. The beach is segregated into two, the Big Vagator Beach and the Little Vagator or Ozran Beach. Along the beach side, there are various stalls available that sell clothes, soft drinks, snacks and trinkets. It is the northernmost beach of the Bardez Taluka, located opposite to the Chapora River. The best time to visit this beach is between the months of September and March. Reckoned to be one of the best kept secrets of North Goa, Mandrem Beach is a must visit for solitude seekers. The beach is situated about 21kms from Panaji and is divided into two parts; one is called Junas and the other Ashvem. Laid back and languid, Mandrem Beach is ideal for yoga, meditation and ayurveda practices and this is what makes this place unlike others. It is absolutely a place to find the true bliss. Most accommodation, dining and alternative therapy options can be found along the narrow beach-access road, or on the scintillating sands themselves.